In this tribute to the late American actor, James Dean, you get to hang out with the rebel without a cause and get chances to win cash payouts while you are surrounded by memorabilia of him. 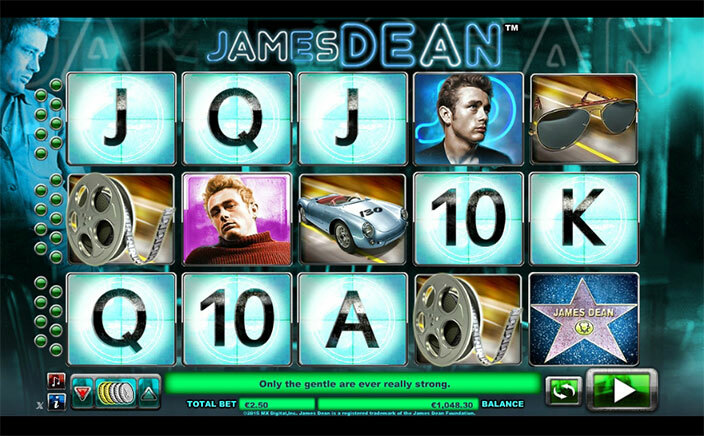 James Dean has been developed by NYX Gaming, a group that has made its mark with online casino games. This game has some hip graphics that will get you wanting to play the game even if you weren’t too big a fan of the actor to begin with. James Dean was a pop culture icon mainly known for his role in the movie, Rebel Without a Cause. His untimely death at the age of 24 left many people saddened, which is why NYX Gaming devised this tribute to him to help you relive what made him such a great actor to begin with in the first place. You can start to play the game by placing your wager and then giving the reels a spin. You will find that the game has 25 paylines on 5 reels and has all of the symbols that you would have associated with this actor, including a pair of RayBan sunglasses, a roll of film, a bike and a sports car. With every spin, you have a famous James Dean quote appear below the reels, giving you plenty of trivia in case you were ever to appear in a quiz about him. Respins: If you get three or more of the symbols of James Dean, you can enter the respins round of the game in which you can see reels 2 through 4 becoming expanded wilds, with three free spins so that you have a payout of 3x your wager multiplier. Free game: The free game feature is activated in which you have three or more of the Hollywood star symbols giving you spins, which can become legend spins if you have a clapper symbol on the reels as well. This allows you a multiplier of 5x your wager. Pick me bonus: You will have three James Dean symbols displayed in this bonus feature and if you pick the right one you can get up to 150x your bet amount. If you get this feature in the free game, you can get 300x your bet amount, while you can make up to 750x your bet amount if you get it while in a legend spin. 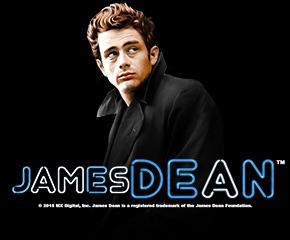 James Dean is a progressive jackpot slot game with an RTP of 95.416%, and is a great game to play for its bonus features even if you aren’t too familiar with this great actor or his work.